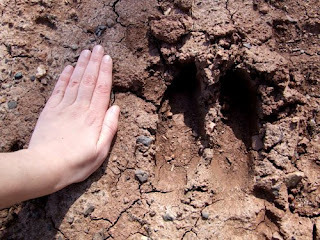 My friend and I were trespassing mildly, walking along the Lakewalk extension that is not officially Lakewalk yet but is instead a muddy path dotted with construction vehicles, and there were these enormous tracks in the mud--six inches long, with a stride of about three feet--that really can't be anything but moose. This is well into the city, at least a mile and a half from any woodsy area, and to have come from there he would have had to walked down some paved roads all Northern Exposure style. He could have also come into town through the country club (which is mostly golf course) and then walked about a mile down the railroad to leave his tracks in the mud on the Lakewalk extension. Why? I don't know. This particular moose was probably not the healthiest moose in the world, but apparently there are reports of moose wandering into town on a rare but regular basis. I am positively tickled to live in a city that can house over 80,000 people plus the occasional moose.